In case you're not from Zagreb, or Croatia, there is one thing you should about us - there is nothing we love more than sitting in a cafe with our friends, for hours, drinking coffee (which tbh usually turns into beer/rakija/cocktails) and just chatting the day away. And no, this isn't like your typical "oh let's get coffee" kind of a situation where you spend 15 minutes in a coffee shop waiting for a barista to make you a cup of frappucino, I mean full on coffee date. This is how you meet new friends, hang out with your old ones, go on dates with potential partners, hear the latest gossip, start your day or of course, relax after a stressful one. It is also very common for us to literally plan our day based on when we're going out for coffee. So yes, your lunch that day may be a little later than anticipated, because you just had to hear the crazy story that happened to your friend. Because of all this, some cafés have decided to spend a little more time decorating than others, and let's be honest, who doesn't like going to places that make that interior-loving piece of your heart skip a beat? 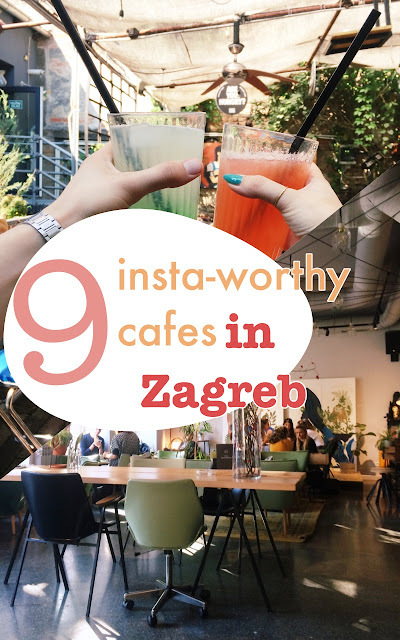 I, personally, am *obsessed* with them, and thus have decided to create a small list of some of my favourite insta-worthy cafes in Zagreb, those in which you just can't find a bad angle and where your coffee cup will always look amazing. Hidden at the end of Dežman passage, Velvet looks like a dark mix of fantasy and modern come to life. What also makes this cafe special is the fact that it is one of the not many nonsmoking cafes you'll find in Zagreb. With antique furniture, books and modern-day installations, the first time you come in here you'll probably want to take a few seconds just to scan the whole place. Once you're settled down in the lovely velvet covered sofa, you can enjoy some coffee, tea, cakes and biscuits, both inside the cafe or on the lovely hidden terrace right besides it. Like Velvet, Finjak is a real life fantasy, but in this case an extravagant, warm and vintage reality where you'll feel like you rule the world. Covered in antique mirrors and flowers, it is surely "The most instagrammable place in Zagreb", as their Instagram bio says. It has also been used for campaigns and editorial shoots, and countless Instagram photos which can rarely do it justice. For the nonsmokers here, you should be happy to know that this place is for you, but for the others, you can also enjoy it's beauty on the quirkily decorated terrace. You'll find this gem of a place on Vlaška 78 safely hidden in the courtyard, because most hidden treasures you have to discover on your own. A small green paradise in the middle of the city, Botaničar is filled with all sorts of plants, retro furniture and ever-changing exhibitions which always cover its walls. You can find it between the botanical garden and the city archives, on M. Marulić Square 6, and don't be surprised if you walk into an event, as they host vintage pop up stores, small concerts and gathering here as well. While you're there, make sure you enjoy some tea, coffee or a craft beer and the lovely atmosphere it has. And in case you were wondering, it is both group friendly, as it has a big community table, and smoker friendly (explains why all the hipsters and artist are in love with this cafe). If you're a bit tired of always going out for coffee in the centre, you'll be happy to know that there are many beautiful cafes outside of it as well - and Greenery Procaffe is one of them. Continuing with the botanical theme, this industrially decorated, with botanical elements of course, cafe is situated on Vukovarska 52e. What makes this one stand out is the fact that it is the first cafe in Croatia where you can get something printed onto your coffee - be it a text, photo, inside joke, you name it. But if you scroll through their pictures on any site you like, you'll see one the best things in the world - they have swings inside. Yes, you read that correctly, there are a few tables inside where you can lightly swing while having your morning coffee or afternoon cocktail. And if that hasn't gotten you interested yet, I don't know what will. Both a hostel and a cafe, Swanky Garden is one of the city's favourite summer terraces, with its colorful lemonades, drinks, fun interior and exterior, and chill ambiance. If you manage to find a seat, you may be sitting at an oil barrel turned into a table, on stairs turned into seats or in a beach chair overlooking the pool reserved for the hostel guests. They also throw amazing parties, as well as make great cocktails so you can't go wrong with neither going here for a coffee in the middle of the day, nor spending your evenings here. You'll find this retreat at Ilica 50, right in the centre of the city, but yet again, it is hidden away in a courtyard, past the hostel entrance and after a small climb of stairs. If you know me, you'll know that this is my favourite cafe. Every Croatian has that one cafe where they know they can always come, the waiters know what they will order because by that time they're already friends with them, and they feel like that place is their second home. Well, that's what Dvorište is for me. Showed to me by a friend who loves coffee years ago, because what made them popular in the first place was the fact that they roast their own Cogito coffee in the room next to the cafe, so when you walk towards it you can often smell coffee from meters away. But what I adore the most, is the vibe it has - a relaxed, artistic, and laid back place where everyone can escape from all the city noises, while staying in the centre, drinking amazing freshly grounded coffee, enjoying a big cup of tea and drink craft beers, and admire all the cats that frequently visit this amazing courtyard in Žerjavićeva 7. And yes, this is just one more of the hidden cafes you'll find in Zagreb. Two baby brothers to Dvorište, you can find Cogito Coffee Houses in Varšavska 11 and G. Deželić passage 40. Minimalistic, yet retro and trendy interiors and specialty coffee is what makes these cafes stand out and become Zagreb's residents favourite places when they just want to relax with a hot beverage in their hands, or start their day and grab a to-go coffee (yes, they actually offer that). It is also, like Dvorište, a nonsmoking cafe, but many will agree to taking smoking brakes just so they could enjoy their cute interiors and freshly brewed coffee. Express is one of those small coffee houses hidden in plain sight that you never knew were cool until you accidentally walked into them one day. Placed on Petrinjska 4, it has both a big outdoor seating terrace and a small, but quirky, inside. For all the coffee enthusiasts, this cafe serves specialty coffee, which is brilliantly shown on one of their walls where they painted a huge pie chart of different coffee types. Something else that you can't miss when you walk inside is the bike they have above a bar, but what I like most is how hidden away you feel inside from the busy world outside. So, my advice is, sit by the glass, order a cup of their amazing coffee and tea, and just watch the people go by. Last, but not least, is Program on Martićeva 14F. I myself discovered this place quite recently, but am so glad that I did. Turns out, small cafes and cute interiors are some of Zagreb's best things, and Program proves just that. This cafe feels like 5 different ones combined into one - colorful seating, tables made out of raw concrete material in bags, pink chairs on the ceiling, Maroccan tiles, and I can go on! But somehow, with the cozy vibe it has, everything matches everything and creates a kind of a playful, yet relaxed atmosphere. It is also one of the nonsmoking ones and has a great selection of teas, amazing coffee, craft beers and a variety of wines. Oh, and also, Zagreb has a lot more than 9 good looking cafes, let me know if you'd like a part 2 of this series, I have enough materials to make at least 2 more posts like these!